The New England Patriots travel to New Orleans to take on the Saints in a game that features two teams reeling from week one defeats. 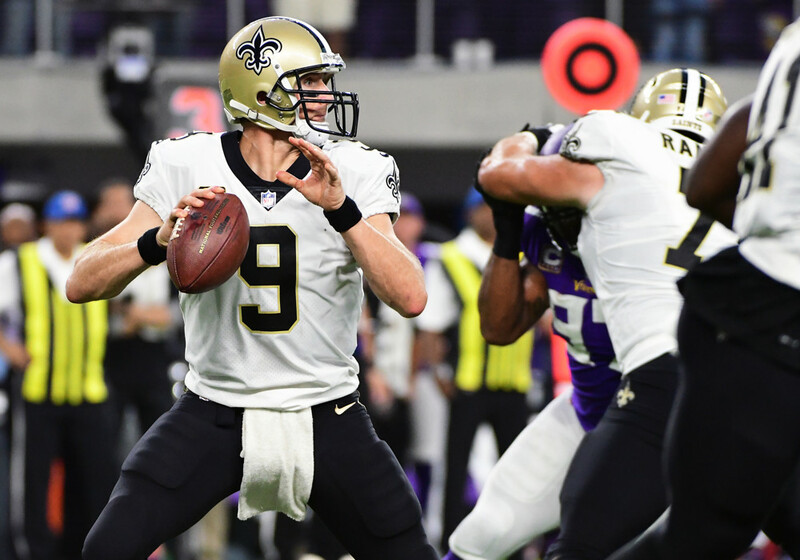 The defending champs took it on the chin from Kansas City and the Saints were completely outclassed by the Minnesota Vikings. With faltering defenses, this has all the looks of shootout with plenty of real points and fantasy points to go around. Ho boy, look out, here comes mad Tom Brady. After suffering an embarrassing loss at home to the Kansas City Chiefs, Brady is going to be extra motivated to beat the Saints. And this is a Saints secondary that just made Sam Bradford look like an All Pro. Sam Bradford! Start Brady with the confidence of someone who just bet on the Harlem Globetrotters to beat the Washington Generals. Rob Gronkowski ran into a tough matchup with Eric Berry and the Kansas City defense in week one. He also dropped a touchdown and saw Mike Gillislee score three times. The good news is the Saints secondary is terrible and surrendered a touchdown to Kyle Rudolph last week. Expect Gronk to get back on track and have a big day this Sunday. Brandin Cooks may have caught only three of his eight targets against the Chiefs but he still totaled 88 yards. Additionally he drew four penalties and looked extremely dangerous as a the vertical option in the Patriots offense. Against his old team, with something to prove, Cooks presents a WR1 option in week two. Picking up right where Legarrette Blount left off, Mike Gillislee converted three of his five goal to go touches into touchdowns. He also had 15 carries, a high percentage in a previously perceived running back by committee. His scoring will remain dependent on touchdowns, but the Patriots figure to score a lot of points this week so he is an upside flex option. The expected challenge from Rex Burkhead and Dion Lewis for passing downs never materialized as James White garnered over 50% of passing down snaps. He even attempted 10 rushes, though with limited success. The Patriots backfield is still messy but White offers a solid flex play in a week two shoot out against the Saints. Drew Brees will be happy to be back in the Superdome where he has averaged much better statistics over his career. He will also be happy to see the New England secondary that has been getting torched since week one of the preseason and make Alex Smith look like an All Pro. Alex Smith! Drew Brees is a must start and positioned to put up big points. Michael Thomas drew a tough matchup in week one as he was shadowed by first team All Pro Xavier Rhodes. Despite the assignment, Brees still looked his way often, targeting Thomas eight times. Expect much better numbers and a likely touchdown as Thomas takes on a much worse secondary. Start him with confidence. Coby Fleener was a nightmare last season but was the only Saints player to outperform expectations in week one. The Patriots did a good job containing Travis Kelce last week but Fleener should continue to see looks with Willie Snead sidelined with his suspension. Fleener is a borderline TE1 but keep an eye out for drops or a decrease in targets that plagued him last year. Mark Ingram saw his usual 10 to 15 touches (11 in this game) but was relatively ineffective as the Saints fell behind early and could get nothing going on the ground. New England is another tough matchup on the ground as they allowed the third fewest rushing yards last year but Ingram remains involved in the passing game and should have ample opportunities to score. He is a RB2/Flex play. Alvin Kamara matched Mark Ingram's touch total with 11, and looked the most dynamic of the Saints running backs. He remains a PPR commodity as most of his touches came on passing downs, but offers an interesting flex option this week and moving forward.